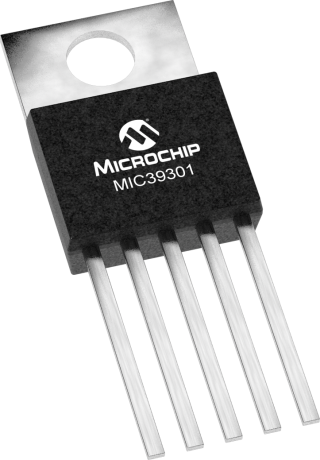 The MIC39300, MIC39301, and MIC39302 are 3.0A low-dropout linear voltage regulators that provide a low voltage, high-current output with a minimum of external components. Utilizing proprietary Super βeta PNP® pass element, the MIC39300/1/2 offers extremely low dropout (typically 385mV at 3.0A) and low ground current (typically 36mA at 3.0A). The MIC39300/1/2 is ideal for PC add-in cards that need to convert from standard 3.3V to 2.5V, or 2.5V to 1.8V. A guaranteed maximum dropout voltage of 500mV over all operating conditions allows the MIC39300/1/2 to provide 2.5V from a supply as low as 3V, and 1.8V from a supply as low as 2.5V. The MIC39300/1/2 also has fast transient response for heavy switching applications. The device requires only 47µF of output capacitance to maintain stability and achieve fast transient response. The MIC39300/1/2 is fully protected with overcurrent limiting, thermal shutdown, reverse battery protection, reverse leakage protection, and reverse lead insertion. The MIC39301 offers a TTL logic-compatible enable pin and an error flag that indicates under voltage and over current conditions. Offered in fixed voltages, the MIC39300/1 comes in the TO-220 and TO-263 (D2Pak) packages and is an ideal upgrade to older, NPN-based linear voltage regulators. The MIC39302 adjustable option allows programming the output voltage anywhere between 1.24V and 15.5V and is offered in a 5-Pin, TO-263 (D2Pak) package.